The key feature of LWRs fuel cycles is that there are many fuel assemblies in the core and these assemblies have different multiplying properties, because they may have different enrichment and different burnup. Generally, a common fuel assembly contain energy for approximately 4 years of operation at full power. Once loaded, fuel stays in the core for 4 years depending on the design of the operating cycle. During these 4 years the reactor core have to be refueled. During refueling, every 12 to 18 months, some of the fuel – usually one third or one quarter of the core – is removed to spent fuel pool, while the remainder is rearranged to a location in the core better suited to its remaining level of enrichment. The removed fuel (one third or one quarter of the core, i.e. 40 assemblies) has to be replaced by a fresh fuel assemblies. Out-In Loading Patterns. In the out-in loading pattern,the fresh fuel batch is placed at the periphery the core, while the intermediate and high burnup batches are placed at the center of the core. At refueling, the highest burnup batch is discharged, the other batches are shifted inward, and a fresh batch is loaded at the periphery. The out-in loading pattern has been found to go too far in the sense that the power distribution is depressed in the center and peaked at the periphery. An additional difficulty is the production of a large number of fast neutrons at the periphery that leak from the core and damage the pressure vessel. In-Out Loading Patterns. 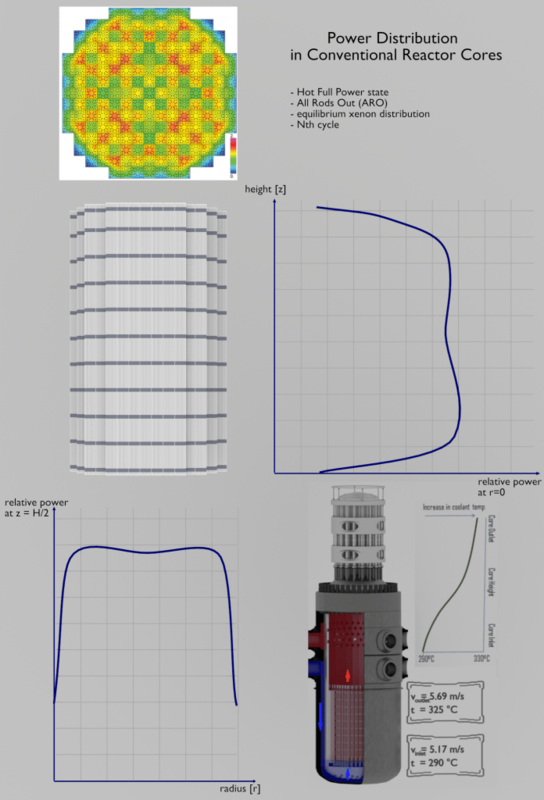 In order to enhance the neutron and fuel economy, core designers designs the low leakage loading patterns, in which fresh fuel assemblies are not situated in the peripheral positions of the reactor core. The peripheral positions are loaded with the fuel with highest fuel burnup. These “high” burnup assemblies have inherently lower relative power (due to the lower kinf and due to the fact they feel the presence of non-multiplying environment – reflector) in comparison with the average assemblies. During fuel depletion, the flux distribution at the periphery of the core increases, especially in low leakage loading patterns. This process is caused by reducing the differences in kinf between fresh fuel assemblies and peripheral high-burnup assemblies. Since the peripheral assemblies have low relative power, thess loading patterns reach slightly higher peaking factors than Out-In loading patterns. On the other hand enhanced neutron and fuel economy allows to load less fresh fuel or less enriched fuel during refueling. A secondary benefit is that loading of the “high” burnup assemblies in the periphery reduces the neutron flux on the pressure vessel. This provides additional protection of the reactor vessel from irradiation embrittlement, caused especially by fast neutrons.